We've got parties (yes...parties plural) coming up here soon. Both Miss almost 7 and Mr almost 5 are due to celebrate their birthdays in the next few weeks. We have actually brought their birthdays forward almost a month due to a big, big adventure that we are embarking on in late April (more on that exciting story later). This year I have scheduled both birthday parties on the same day. Crazy....? Maybe! But at least they'll be done and dusted in one go, and then we have to launch the big house pack-up. Miss almost 7 has a 'thing' about lions. No lion in particular...just lions in general. I don't know where it came from...it just is. So I decided that her party invite would be lion-themed. 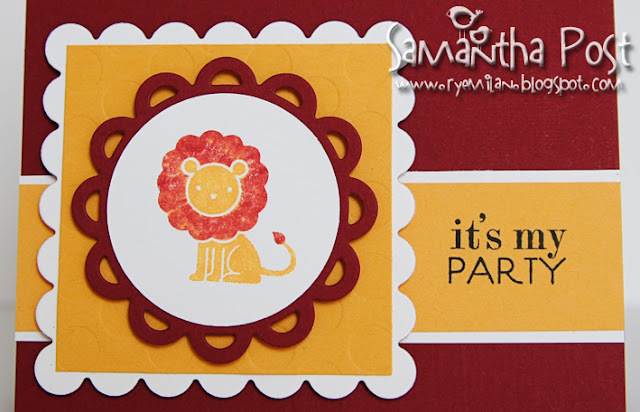 Her current favourite colours are red and yellow...so a red and yellow, lion-themed card it would be! Accessories: Scallop Squares Nestabilities (Spellbinders), Polka Dot Basics II Impression Plate (PTI), Limitless Layers 1 3/4" Circle Collection (PTI), Tombow Mono (Penwa) and Dimensionals (SU). I only recently got the ever-so-cute Fox and Friends stamp set from my stamping buddy Di...who very kindly sent it along for me when she sent a card (I still have this beauty to show you too :-) and gift on the birth of our wee Thumper. Thanks again Di, I love this set! Well, its way past my bedtime...I can barely keep the little peepers open here. 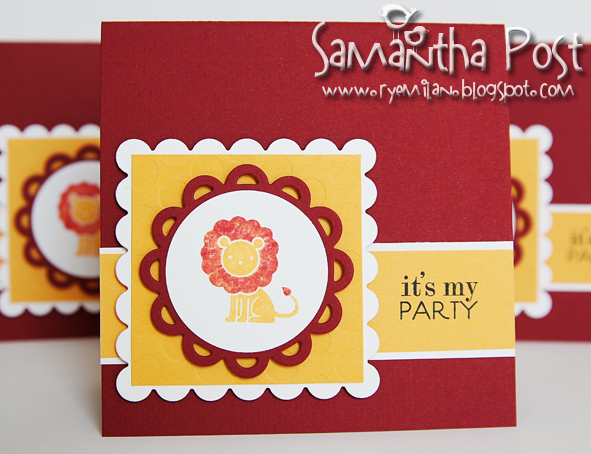 These are gorgeous Sam, I loooove the lion, and the different die shapes are great altogether. Awwwwwwwww Sam this is such a cute little design!! You are one brave woman doing both parties in 1 day. The invitations are gorgeous Sam. As for your big adventure, it sounds to me like you're moving house, interstate perhaps??? Cause THAT would be a really big adventure.